Adopting a solution that effectively reduces wood waste and sewage sludge, the City of Lebanon’s gasification project diverts more than 16,000,000 pounds of waste from landfills every year, cleanly producing electricity to help power the wastewater treatment plant. 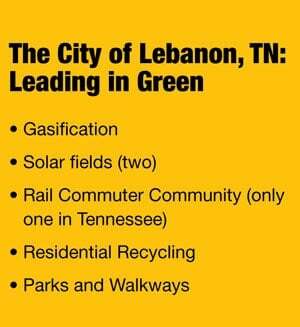 As an expansion of Lebanon, TN’s successful citywide “Think Green – Think Clean” initiative, the Gasification Initiative began in 2015 with the concept of looking for a way to reduce waste in Lebanon, TN. The city’s landfill had about eight years left at the time. Because the city was on a tight deadline, they looked at adopting solutions that would effectively handle waste. The gasification project came into play as a way of reducing the wood waste and sewage sludge. The city had land available at the Waste Water Treatment Plant (WWTP) and since a project of this size takes only a couple of acres, the decision was made to locate the gasification plant on the on the WWTP site due to a significant part of the process that included the processing of the sludge the plant produces. “Many people were involved in the development of this project, including the previous and current mayor, the wastewater treatment plant manager who was integral in solving some of the technical issues as well as Aries Energy who sold us the technology, and in the process, they became a consultant in bringing it up to full speed and have been an excellent partner. It has been a full team on deck to get this up and running. In October 2016, the facility was in operation and as of November 1, the city took over,” says Project Manager, Scott McRae. The facility serves a 22-mile radius for wood collection, while the sludge is right onsite at the wastewater treatment plant. “We have a public/private partnership with the city of Lebanon and Rockwood Recycling. The recycling company picks it up, grinds it and then they send it over to us as a wood chip. They do all the collection and processing so that we can just process the chip into gas,” explains McRae. In addition, the solids from the wastewater treatment plant are processed and turned into clean energy as well. These two key waste streams were very expensive to eliminate each year. This facility takes the waste and processes it and turns it into green electricity, saving the city hundreds of thousands of dollars per year. Since the project has come online, communication has been extensive. 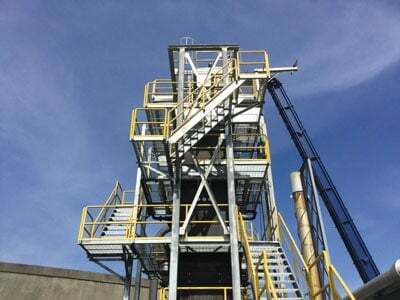 The gasification plant has been in local, national and international media. People are also visiting the site from all over the country and the world to look at the facility. The city also won regional and national awards as well, it has been in the local paper and McRae has spoken about the project at a local rotary club in the area trying to let people know the facility is so unique. “There are people still out there that want to hear this message,” he says. For more information, contact Scott McRae at scott.mcrae@lebanontn.org.